What a great feeling to get back on the road. When I was staying with my family in PA, I forgot my sneakers with the Nike+ sensor, so none of my runs were tracked. That, and moving to NH, has made the last couple of weeks quite light in the running department. I was in LA earlier this week and staying next to LAX. It wasn't the most picturesque of runs, but I was smiling the whole time. It was just so great to get out there. 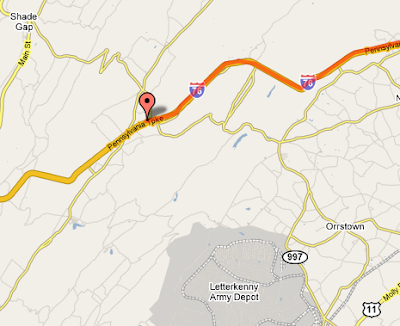 At this point, I'm well on my way to Rt 70 W (towards West Virginia) and am running north of Rt 30. 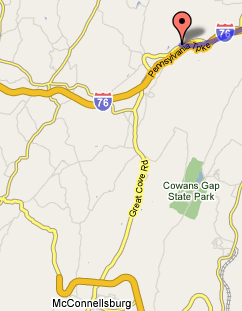 Soon I'll be crossing over Great Cove Rd (whatever the heck that is) and am just above McConnellsburg. Well, as I always say, if you're going to get beat in a Nike+ challenge, you might as well get beat by someone training for a marathon. Congrats on the great running, Maddy. It was very close for a while, but you pulled away at the end with a great 12-miler in what I'm sure were very hot conditions. You certainly earned the victory. If you're wondering about the headline reference, I recall these shirts from my childhood. How sportsmanlike. It was in the high 80s with serious humidity yesterday and I was none too happy to be running in it, but I didn't run that much on Saturday (also too warm) so I thought I should get a decent run in. As it was, I had to stop a couple times to catch my breath and try to cool down. It's been brutal. That said, I still paced under 8, which is always nice to see. This one hurt, though. Over the last 6 weeks, I've found that I'm continually running 9-minute milers. However, in the last week, I've been running in the high 7s/low 8s and have been very consistent. I'm not sure if it's a matter of mind over matter, weather, etc. Regardless, it's nice to see an increase in speed. That said, I don't want to lose sight of why I started running in the first place--fitness and more importantly, weight loss. I've been starting to look at a book by Stu Mittleman, "Slow Burn" which talks about working with your optimal heart rate rather than trying to set a land speed record. It's something that I want/need to be conscious of, especially since I'm not trying to win any races, but just generally complete them with a reasonable time and improvement from the previous time. At this point, I'm 158 miles in and would be on the very boring stretch of turnpike on my way towards Pittsburgh. I'm well past Newville and closing in on Rt 70 W to take me into Ohio. So I decided that I won't post every run (purely out of laziness), but I will post the ones that are especially good or bad. Thankfully, this was a great run. I had been pacing much closer to 9 minute miles over the last month or two, which was up from my typical 8 1/2 pace. Today, I ran 6 miles and averaged very close to 8-minutes. It was one of those days where your legs are just moving at a good pace and you're not even thinking about it—you're just running. I wasn't feeling tired or anything and probably could have run for a lot longer. Though Nike+ tells me I've run less than 5 miles, I know it was almost exactly 5 miles (if not a bit more). Today was one of those days where even 5 miles was a struggle--heck after two miles I was wondering if I could even hit 5. Regardless, glad to get through it.